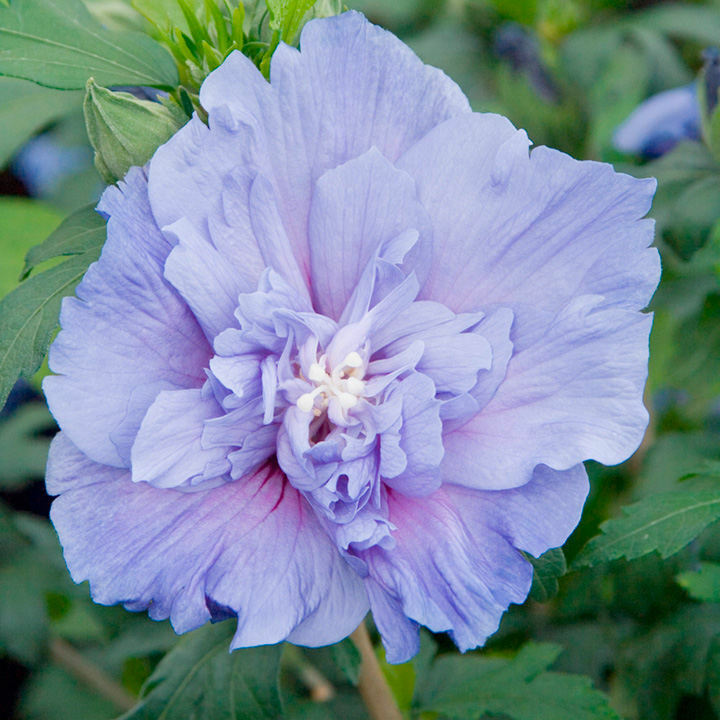 Hibiscus syriacus Blue Chiffon 'Notwood3' is a deciduous shrub with green, lobed leaves and is an RHS Award of Garden Merit winner. Flowers are large pale blue and semi-double with a star-like red-purple stain at the base of the outer petals. Unlike some of the older, double varieties Hibiscus syriacus 'Notwood3' stands up particularly well to wind and rain. Flowers July-September. Height 200-250cm. Supplied in a 7.5-10 litre pot. Hibiscus syriacus Blue Chiffon 'Notwood3' is a deciduous shrub with green, lobed leaves and is an RHS Award of Garden Merit winner. 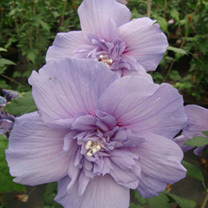 Flowers are large pale blue and semi-double with a star-like red-purple stain at the base of the outer petals. Unlike some of the older, double varieties Hibiscus syriacus 'Notwood3' stands up particularly well to wind and rain. Flowers July-September. Height 200-250cm. Supplied in a 3 litre pot or 7.5-10 litre pot.